At eye level with the three thousand metres high mountains of the Hohe Tauern National Park! The glaciated flanks of the three thousand metres high mountains of the Hohe Tauern National Park, the rugged corries of the Steinerne Meer, the grass-covered slopes of the Kitzbühel Alps, the Watzmann, the Wilde Kaiser or the Dachstein to name just a few of the highest. The glacier of the Kitzsteinhorn and the Zell Basin with the deep-blue glittering lake stretch below the platforms. 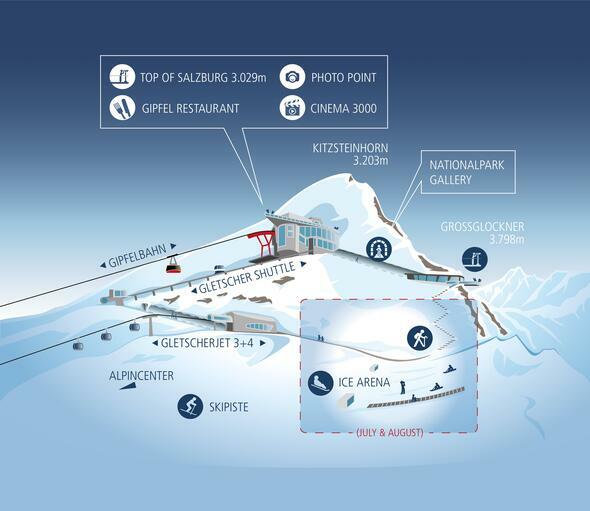 The "Top of Salzburg" viewing platform is at the summit station of the Kitzsteinhorn in 3.029 metres above sea level. Easily accessible by cable cars, this panorama point is not only unique, it is also the highest-situated point in Salzburger Land and the entire Hohe Tauern National Park region which is easily accessible for everyone. Step onto the terrace and you will be overwhelmed by the stunning view to the surrounding mountain world. General overview boards explain which summits are at your fingertips here and special telescopes also tell you the names of the impressive mountain giants. "Smile, please!“ is the motto at the automatic photo point – having taken a photo, you can download it from the website free of charge afterwards. The National Park Ranger tours and the "My first three thousand metres high mountain" guided Kitzsteinhorn summit tour also start from the "Top of Salzburg" viewing platform in summer. Best views in the Hohe Tauern National Park! The 360-metre-long tunnel leads from the summit station of the Kitzsteinhorn in over 3.000 metres above sea level to the "National Park Gallery“ viewing platform. The bright light and the marvellous view after the mystic darkness of the tunnel almost take your breath away. The platform at the south flank of the Kitzsteinhorn protrudes directly into the pristine wilderness of the Hohe Tauern National Park and offers a marvellous view to a sea of peaks of the three thousand metres high mountains. To the south is Austria's highest mountain, the 3.798-metre-high Grossglockner. To the west, the glaciated peak of the Großvenediger glistens in the sun and winter sport fans enjoy natural snow below the glacier. In summer, a secured path leads from the viewing platform downhill to the Ice Arena where you can enjoy tobogganing and sliding in summer snow. National Park Rangers guide you free of charge through the Gipfelwelt 3000 at the Kitzsteinhorn daily in summer and weekly in winter.